FlexScan monitors come with ambient brightness sensors which automatically adjust the screen to the ideal brightness level which increases viewing comfort. Ergonomic stands feature height adjustment, tilt, swivel, and portrait mode dispaly. EIZO even has an application that will remind you to take a break periodically and tell you how much time you use your monitor each month. 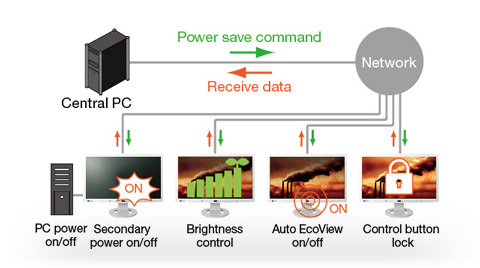 EIZO's power management software allows you to reduce power by centralizing control over the power settings of FlexScan monitors on a network. A network administrator can turn the ambient brightness sensor of most FlexScan models on and off, and switch the monitor's secondary and PC's primary power on and off regarless of the manufacturer. The software is available free of charge. The FlexScan EV2315W has 170° horizontal and 160° vertical viewing angles which makes it suitable for the viewing requirements of most control rooms. For viewing environments where the monitor is placed above eye level, an "Up View" function minimizes any washing out of colors that may occur when looking up to view the screen.